Before I get started with my blog post for today, I need to make an announcement. As promised in my last post about my 5-Year Blogiversary, a winner has been randomly chosen by my unbiased husband. And the winner of the set of four cards is ANGIE CHURCH! Angie, please contact me with all your pertinent information so I can get your prize out to you. CONGRATULATIONS, ANGIE! 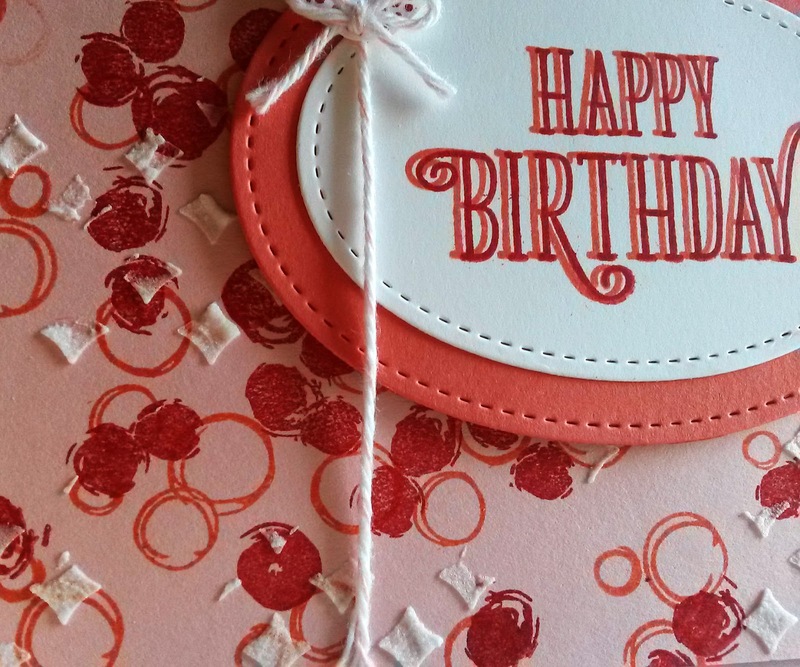 A new product in the annual Stampin' Up! catalog is Embossing Paste (page 201) and its accompanying accessories, Pattern Party Decorative Masks and the Palette Knives, also pictured on page 201. I used the diamond-shaped mask for my dimensional background. I was not at all careful or precise about my application of the Embossing Paste. This was totally planned. Really. I wanted it to blend in with my "confetti", so I did want any regularity at all. the Playful Backgrounds set on page 150. Tying baker's twine to the balloon adds a lot of realism, right? 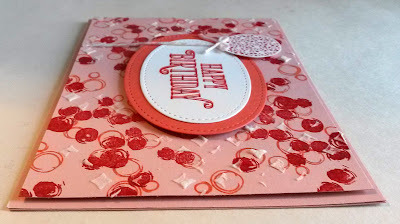 along with the Embossing Paste. 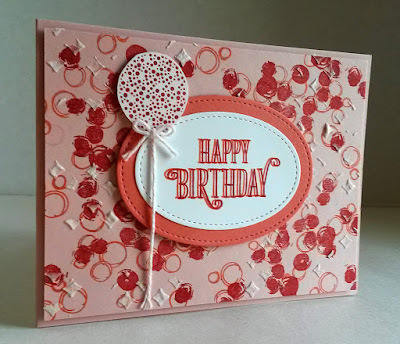 It's just such a fun and lively card, it is sure to make the recipient smile. Would you like a tutorial on how to re-create this card? Just catch the supplies list and instructions that follow. THE MOST IMPORTANT THING TO REMEMBER WHEN USING EMBOSSING PASTE IS THAT IMMEDIATELY AFTER YOU FINISH WITH IT, USE WARM WATER TO CLEAN THE PALETTE KNIFE AS WELL AS THE STENCIL. IF IT'S NOT COMPLETELY REMOVED, IT WILL HARDEN AND RUIN THE TOOLS. Fold a 4 1/4" x 11" piece of Blushing Bride cardstock in half, creasing it well with a bone folder. You will be building a background base on a piece of Blushing Bride cardstock that measures 4" x 5 1/4". Randomly stamp the open circles in Calypso Coral, followed by the solid circles in Real Red. Now, you will be adding the texture: Lay the diamond mask over the cardstock. With one of the palette knives, gently scrape small amounts of the Embossing Paste through the mask in random places. You don't want to actually build up a pattern; this is just to add some interest and dimension randomly. IMPORTANT: As soon as you finish the previous step, wash off your tools with warm water! 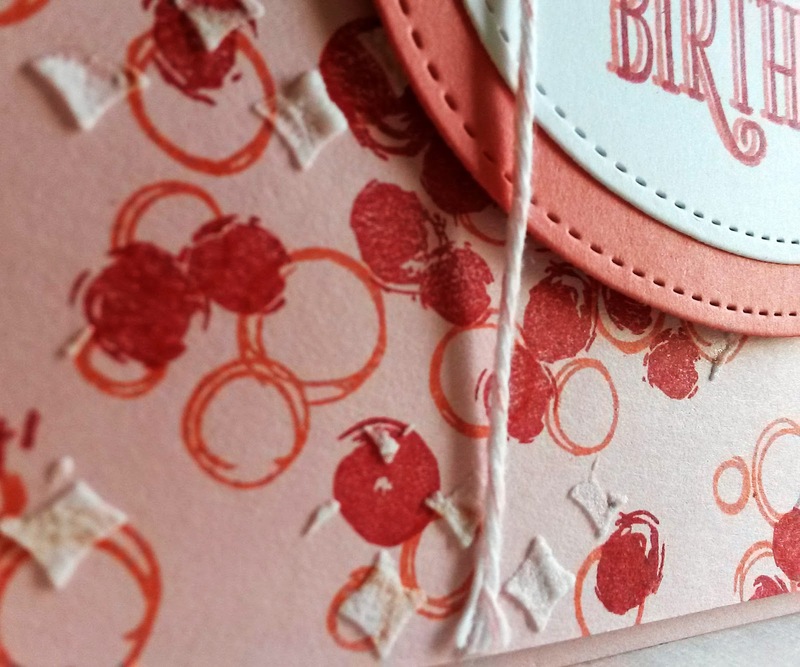 Hit the Embossing Paste briefly with the Heat Tool. 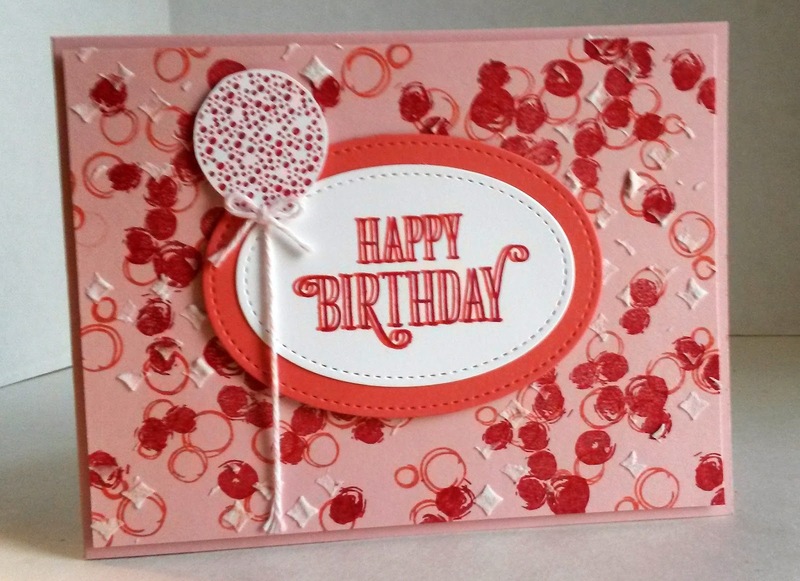 Set this aside to dry completely while you finish the rest of the card pieces. The Embossing Paste really does dry quite quickly. On a medium-sized Whisper White Stitched Shapes oval, stamp the sentiment in the center. First stamp it in Calypso Coral. Clean the stamp and ink it up with Real Red ink. Since this is a clear stamp, visually align the stamp over the first image, but moving it JUST SLIGHTLY to the right, and stamp, to give the sentiment a shadow effect. Glue this piece to the largest Stitched Shapes oval, cut from Calypso Coral. 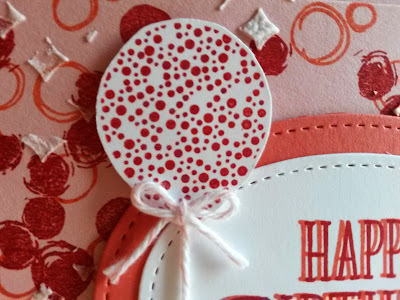 On a scrap of Whisper White cardstock, stamp the dotty balloon in Real Red. If you have the balloon punch, use that to punch it out. Since I don't own it, I fussy cut my balloon leaving a fine white edge around the balloon shape. From Blushing Bride Baker's Twine, tie a small bow, and glue it to the bottom of the balloon. Tape one end of a small length of the same Baker's Twine to the back of the balloon. Put the card together: Use Stampin' Dimensionals to adhere the confetti layer to the card base. 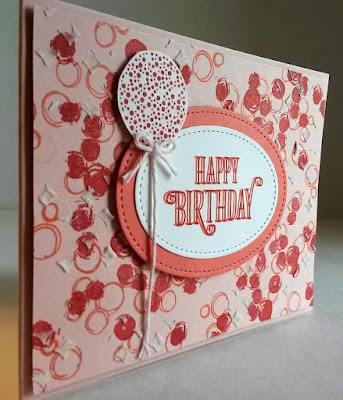 With Stampin' Dimensionals, pop up the oval piece against the confetti backdrop. A Dimensional will finish it off with the balloon being added to its spot. 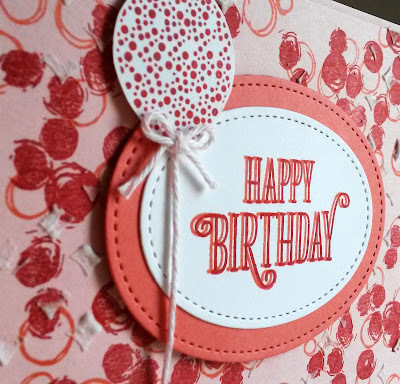 Add a drop of glue to the bottom of the balloon string to secure it to the card. Such a lovely card and like the way it adds a bit of texture using the paste. What a fun card, I love the extra dimension that the paste adds. Congrats to Angie! This pretty card would work for Valentine's also. 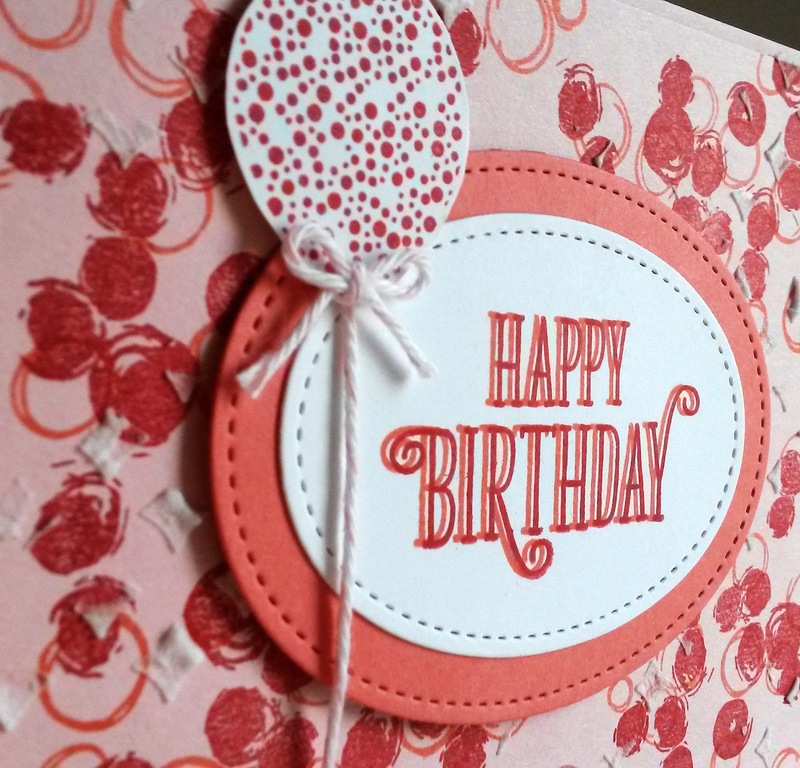 You have taught me that there's more to making a card than cutting out stock paper. Hats off to you for continuing to grow in your craft. Thank you for sharing with us at Celebrate Your Story, and have a great weekend.